The approach to Mondavio from the Via Flaminia at Fossombrone takes you through delightful rolling Marche hills. Bright geraniums and spreading cedars add a graceful tone to this beautifully preserved, red-brick medieval hill town. 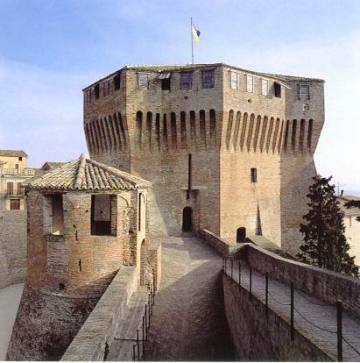 The imposing fortifications (above) that stand out from afar were built by Francesco di Giorgio Martini, one of Italy's most celebrated Renaissance military architects, and still stand guard over the place. They now house an entertaining 'living museum' (actually dead wax dummies ) portraying life when the Rocca was built at the close of the 15thC for Giovanni della Rovere, son-in-law of Duke Federico da Montefeltro - youngsters will particularly savour the torture chamber. It won't take you long to wander around the compact centre and, if you've got time to kill, stop for an ice -cream and fine views at the bar in the little shaded park near the square.